Spring Blooms in Lewes with Tulips, Kites and Culinary Celebrations - Eat. Drink. Buy Art on Delmarva. If the warmer temps and the hint of sun has you thinking about a spring getaway, consider Lewes, Delaware. This historic and charming seaside town features boutiques, galleries and dining adventures for even the most seasoned traveler. Lewes also hosts some sweet spring events that you simply must schedule in — they are full of tradition, local culture and fun. 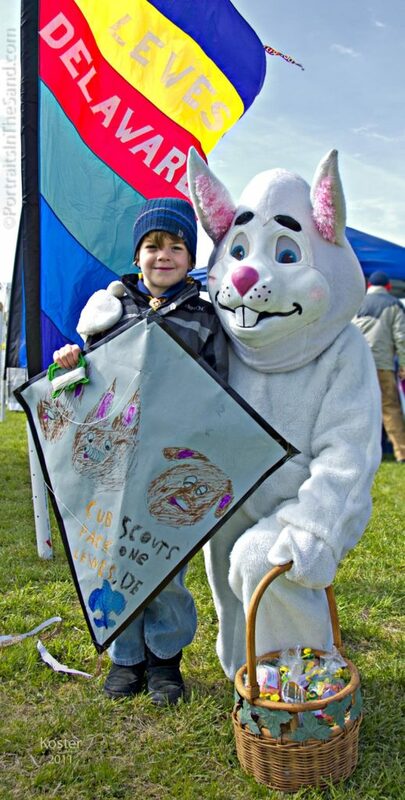 The Great Delaware Kite Festival, co-sponsored by the Lewes Chamber of Commerce and the Delaware Division of Parks and Recreation, annually takes place at Cape Henlopen State Park on Good Friday. Kite flyers get a chance to compete — from kids to adults. Within each age category, kite flyers are judged by the type of kite they are flying — home-made or store-bought. The Special Class awards include the Open Individual Ballet (free flight performance accompanied by music which the entrant provides), Individual Precision (compulsory figures including “The Square,” “The Mount,” and “Ladder Down” judged on technical execution), Most Senior Flyer, Youngest Flyer, Flyer Furthest From Home, Smallest Kite and Largest Kite. The Highest Kite Award category is open to all ages. For those who have not made their own kites and want to participate, Kids’ Ketch and Rehoboth Toy & Kite Company will be on-site selling a wide variety of kites with space, adjacent to the competition field, to practice in advance of the competitions which begin at 11:30 a.m. Additionally, there are food vendors, a face painter and community organizations set up surrounding the field. The timing of the tulips’ appearance is an inexact science and to that end, the committee expanded the time frame of the event to enhance the chances that the tulips will be visible during the event. The event dates (April 5-14) span two weekends with special events planned on Saturday, April 6. On both April 6 & 7, the Tulip Celebration’s Photography Contest submissions will be displayed in a tent in Zwaanendael Park from 11a.m. – 3 p.m. on Friday and Saturday from 10 a.m. – 2 p.m. and then it will be displayed inside the Fisher-Martin House from Sunday, April 7 – 14. On April 6, Lewes in Bloom will be staging a sale in Zwaanendael Park from 9 a.m. to 3 p.m. with potted tulips among other plant-related items for sale. On the following Saturday, April 13, their sale will be in front of Citizens Bank. There are other activities taking place in Zwaanendael Park on April 6, including the Lewes Beekeeping Club sharing good family-friendly information, honey samples from their bees, a demonstration hive, and tools of the trade including a bee suit and smoker. They will offer seed packets of flowers to get your pollinator gardens started this spring. The number of tulips and other spring bulbs planted in the City’s parks and other public locations expanded to more than 20,000. The locations of the plantings will be identified on the map produced in association with the celebration. More than 100 varieties will be on display. They were all planted by Lewes in Bloom volunteers, an organization of volunteers who promote the beautification of Lewes by planting flowerbeds and planters throughout the City and maintaining them during the entire growing season. Lewes in Bloom is coordinating a new feature to this year’s Tulip Celebration. The third annual “Lewes TWO-Lips Culinary Week” that takes place beginning Friday April 5 is a collaboration with the Lewes Chamber of Commerce and its members in the restaurant sector, chaired by chamber board member Rich Garrahan, co-owner of the Crooked Hammock Brewery. This Culinary Week format does not follow a traditional “Restaurant Week.” Each participating business will identity a “specialty” menu offering that will be available from Friday, April 5 – Thursday, April 11. Patrons who order this specially designated item will fill out a raffle form that will enter them in the contest with all the others who order these items during the culinary week. The grand prize drawing will include a two-night stay at the Dogfish Inn (date restrictions apply) with gift certificates and merchandise donated by the participating restaurants. A complete list of the participating restaurants will be available closer to the event. For more information on all that Lewes has to offer, visit the Lewes Chamber of Commerce website and get planning your spring trip to Eat. Drink. Buy Art and explore!